I am a ridiculous human being. I swear I closed the lid. And yet, no. Clearly, I did not. I am mad at myself. This is so wasteful! 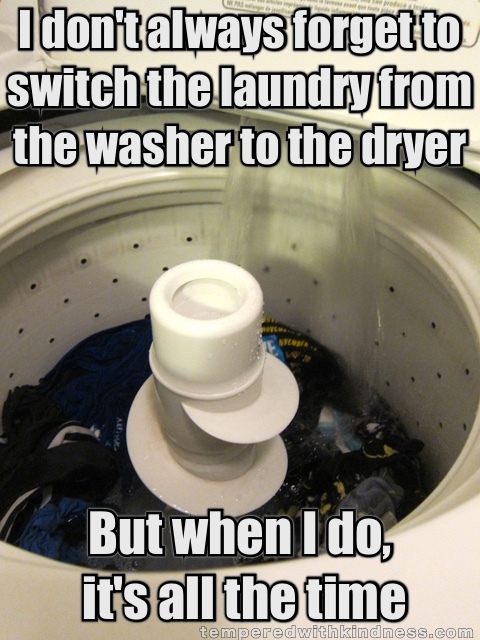 How can I remember – before I run out of underwear – that there is laundry in the washing machine? I live a distracted life. Once upon a time I had the most beautiful washing machine. It was the coolest colour and it had a buzzer on it that was so loud it could make your heart stop. Man, I loved that thing. That was what seems like a lifetime ago, now, though. Long ago and far away, when Thing 1 was teeny and I was blonde – because my hair grew out of my head that way, naturally – as opposed to, well.. never mind! Please tell me I am not alone in my forgetfulness. *Look! I made a meme. I’m so proud! The lengths I’ll go to for my tens of readers. I mean, really!